On Monday, May 6, Roundabout Theatre Company (Todd Haimes, Artistic Director/CEO) will host their fifth annual Casino Night, at the American Airlines Theatre (227 W. 42nd St). All proceeds benefit Roundabout Theatre Company’s many programs, including the Education programs, the Theatrical Workforce Development Program and Artist Residencies. World Series of Poker winner and Roundabout star Jennifer Tilly (Don’t Dress for Dinner) and Laura Osnes (Anything Goes, Cinderella) will host the event, and World Poker Tour Champion Phil Laak will have a seat at the table. 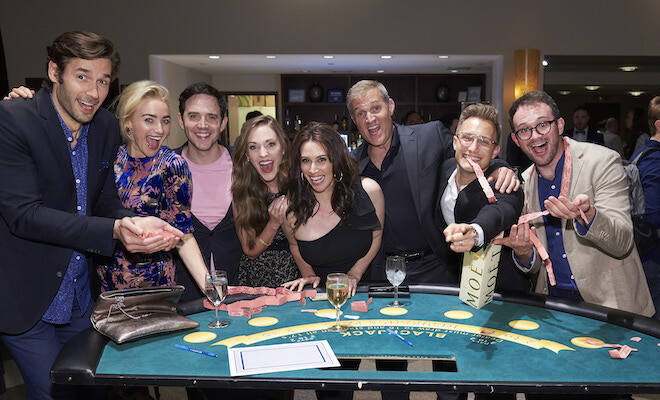 The casino event will include a Texas Hold ‘Em Poker tournament and Black Jack tournament, featuring celebrity players and Roundabout alum including Michael Arden, John Behlmann, Michael Berresse, Wilson Bethel, Dave Thomas Brown, Bobby Cannavale, Tracee Chimo, Eddie Cooper, Kathryn Erbe, Midori Francis, Drew Gehling, Alex Gemignani, Gina Gershon, Gideon Glick, Sas Goldberg, David Alan Grier, Bill Heck, Katie Huff, Daniel Jenkins, Nathan Johnson, Taylor Iman Jones, Marc Kudisch, Maggie Lacey, Beth Malone, Constantine Maroulis, Ryan McCartan, Andy Mientus, Kathy Najimy, Noah Robbins, Krysta Rodriguez, Luke Smith, Alexandra Socha, Cody Strand and Tony Yazbeck. Additional artists to be announced. There will also be open casino games, such as blackjack, roulette and craps. The evening will include an open bar and hors d’oeuvres. Guests will play for prizes in lieu of cash. All levels of experience are welcome to play; professional poker players and amateurs alike. All celebrity appearances are subject to change. The evening is hosted by Leadership Council Chair Carmen Grossman and John Grossman, and American Airlines Theatre’s Head Electrician Brian Maiuri. Table hosts include Michael Cohen, Colliers International NY LLC. The evening’s Presenting Partner is Sweet Hospitality Group. Other sponsors include Belvedere, Chandon, Farmer’s Botanical Organic Gin, Glenmorangie, Golden Ram Imports, Hennessy, Herradura Tequila and Woodford Reserve. Individual Tournament ticket prices range from $300 to $750. General Admission to play open casino games are $250 each, with a special $100 price for Roundabout’s Hiptix and GenR Members. VIP Table packages for $3,000, $5,000 and $10,000 are available, which includes a half or full table and the company of a guest artist. Tickets are available by calling Special Events at 212-719-9393 x 369 or at roundabouttheatre.org/casinonight.